Most of our items are brand new unless otherwise noted. We do not sell bootleg or pirated merchandises. We do not provide actual pictures, but we will choose the best condition item available to our customers on first come first serve basis. Most of our merchandises are factory sealed, but if you found they are not factory sealed, it is most likely due to either our distributor's inspection or that is how they came in. There is NO shopping cart where you can still back out. Most of our merchandises may contain sharp points, small parts that can cause choking hazards, and other elements that are not suitable for children under 3 years of age. During our busiest quarter (Nov, Dec, and Jan), we ask our customers to be more patience as packages are often time get delayed. 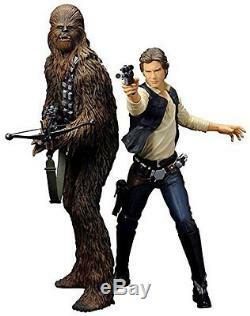 The item "NEW Star Wars Han Solo & Chewbacca 1/10 Scale ArtFX+ Statue by Kotobukiya" is in sale since Monday, February 01, 2016. This item is in the category "Collectibles\Comics\Figurines". The seller is "i-anime" and is located in El Monte, California. This item can be shipped worldwide.